Something wicked this way comes. 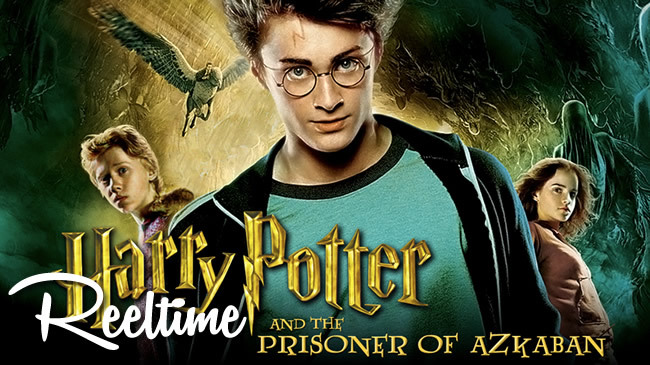 Reeltime Harry Potter continues on 22 July 2017 at 8pm BST. Welcome back to Year 3. I know things get darker from this point, but right from the start with that Warner logo. I was already a fan of director Alfonso Cuaron when this was released. Now he’s know for Children of Men and Gravity. Back then he seemed like a rather odd choice given his decidedly adult coming-of-age road trip movie Y Tu Mama Tambien (“And you mother too”). This is the only Harry Potter film for which I can remember the advertising campaign. Those animated wanted posters with Sirius Black and the trailer with the fantastically eerie choral “Something Wicked This Way Comes”. Does that actually appear in the film? John Williams is great at those little choral numbers, like “Somewhere in My Memory” from Home Alone. A rather Roald Dahl opening with the ballooning aunt floating away. Already doing a much better job at creating a sense of place. Like the choice of reading material. Now this living book is the sort of whimsical aside that these films have been missing. The cinematography and framing is already such a major upgrade. Mr Weasley taking Harry aside from the others to discuss Sirius, punctuated by the posters of him screaming. Oh good, the song is in. Kind of an odd place for it though. Michael Gambon’s Richard Harris impression makes this sad transition feel pretty seamless. All of this moving camera work makes Hogwarts feel so much more three-dimensional a world. Who doesn’t recognise a Hippogriff, Ron? “Like catching smoke with your hands.” How would kids know anything about how hard catching a wanted criminal is? Alan Rickman continues to be one of the finest things in these films, without saying a word. The shift from robes and uniforms to a lot of scenes in casual clothes grounds the film nicely. -5 House Points for being a know-it-all? Okay. Oooh, weather effects. The low visibility definitely gives Quidditch an added sense of urgency. Even if the game is still ridiculous with its complete focus on the Snitch. But seriously, letting Dementors wander into a game that’s ludicrously dangerous and worsened by foul weather. Health and safety rating: non-existent. The Marauders’ Map, as well as being every schoolkids’ dream, looks beautifully presented. If he’s completely undetectable by senior Hogwarts wizards, that cloak is some seriously powerful magic. I’m guessing it must have some more important significance than we’ve been told so far. My Godfather duties just became a lot harder if I’m expected to match Harry’s. In general though, the year and a half since the last film has definitely improved all three leads’ acting. The magic effects have improved dramatically too, even if they mostly lack much subtlety. “My father didn’t strut.” How on earth could you possibly know that?! The attention to detail in the mise-en-scène is magnificent. Also, notice the regular (though not exclusive) use of hoodies to mirror the hooded robes in a more casual way. That axe-drop didn’t have anywhere near enough force to do any serious damage to anything. I think Harry got 50 points for killing Quirrell. How many for attacking another teacher? Interestingly Sirius and Lupin are both comfortable saying Voldemort’s name. Meaningful magic. Those face-tearing shots are pretty scary. Gambon is loving this. Mysterious and enigmatic. This time-turner reveal is so well-earned. Even if Ron’s comments lacked subtlety, they didn’t give any indication of how. This is actually a pretty tightly-constructed time travel story so far. “Is that really what my hair looks like from the back?” Priorities, Hermione. But yes. Is there a Year 4 hairstyle change? Yeah, that pumpkin chop makes perfect sense. Whenever my work gets cancelled my immediate response is always to attack the nearest veg. Oh Harry, did no one tell you not to make major life plans with a newly introduced character whose life and/or freedom are in peril? I’m guessing we’re going to be seeing this wand shot more and more. But it definitely works here. “You can always find them… in here.” Okay, dialogue is degrading into cheese again. A teacher being forced to quit because of a hidden medical condition. Yikes, that’s a nasty metaphor. The wizarding world has certainly gotten bigger this year. Cuarón did a phenomenal job of raising this franchise up. It’s unsurprising that he didn’t want to get tied in given the number of films yet to come. I’m intrigued to see whether the later films can outdo this. I’m sure the leads’ acting will continue to improve but here everything just flowed together so well under such a strong guiding hand. Introducing a time travel mechanic this early in a series seems dangerous though. Are they going to handwave away the Time Turner somehow, because otherwise it seems like every subsequent film should just follow the same arc as this? Shout out to John Williams for a fabulous score that was a lot more richly varied than many of his. It’s a strong way to bow out (apparently Revenge of the Sith caused a timing conflict with Goblet of Fire and, well, Star Wars). Also, a shout-out to Alexis’ dog, Sirius. So yes, Year 3 breathed a lot more life into a world that had felt rather two-dimensional before. That, I hope, will be retained going forward. Little things like that constantly moving camera make such a difference. I guess we’ll find out soon when we reconvene for Year 4.